I’d like to introduce you all to Julia Melymbrose of Chocolate and Caviar (who clearly knows how to name a company after the finer things in life). Julia’s company has a great email series you should check out on their website. I’m so grateful that she agreed to guest post to bring some of her wickedly wonderful insight to all of you. Enjoy! What is a logo? And what a tagline? You probably think these are simple questions. And you’re right. But do you know what’s really difficult? Answering them! And you know why? Because your logo and your tagline hold such immense significance for your business that they can truly make or break it. This silly little symbol and short simple sentence are the first and most common points of reference customers have with your brand. These are the things that tell them (and constantly remind them) who you are, what you do, and what you stand for. Which, actually, makes them not silly or simple at all. So how can you make sure you get them right? A logo used to be synonymous to “brand.” Used to be. You know when? Back in the 1800s when cowboys used to burn (literally brand, in germanic languages) the farm logo on the backsides of cows to mark them as theirs. And when the term was first borrowed into the retail market, in 1922, it was applied to goods that had been “stamped” by a maker’s mark as a guarantee of quality. But it’s been a looooooooooong time since 1922, and brands have evolved into much more complicated beasts. A logo is no longer “just a stamp” of quality or originality. And a tagline communicates a whole lot more than “John the Cobbler made this.” This ain’t your nana’s village no more. A brand has now essentially become an experience that defines and demarcates your business in a special way. Your brand must communicate not only what you do, but also how you do it, and why people should care. And as emblems of you brand, your logo and your tagline, must roll that what, how, and why into one coherent, representative whole. Say you walked into a room full of strangers where the only way to meet people was by handing out a snapshot of yourself with a short caption. What would that snapshot look like? Would you look all silly and funny in the photo? Or would you be composed and pensive? Would you take the photo in an exotic location? Or on your favorite spot on the couch with your dog curled by your side? And what would you write on it? Would you write something friendly and direct, like “Hi, let’s be friends!”? Or maybe note your top values, like “Love & Honesty”? Or how about something inspirational, such as “Your heart already knows the way”? It’s a tough call isn’t it? But that’s essentially what your logo and tagline are for you business: a snapshot and a caption that are meant to communicate the most essential elements of your brand. 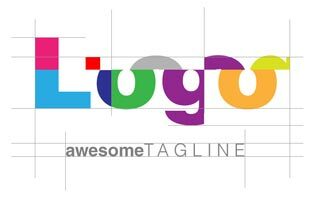 A logo is a snapshot of your entire brand and a tagline is the caption of your core message. And we know what you’re thinking right now. “But I’m not a designer! How can I design my own logo?” or “Writing isn’t my forte! I don’t know if I can write up my entire essence in a sentence!” And that’s okay. No one’s asking you to do so. Most entrepreneurs and business owners have professionals create these two brand elements when the time comes. But what you can and should do, is work on the concept of your logo and tagline. Start thinking not about designs and words, but about the feelings and messages you would like your brand to communicate to create the idea behind the final branding. To better understand what we mean by the “idea behind the branding” and how you can apply our “snapshot & caption” strategy to your brand, lets look at some famous logos and taglines first, to see how and why they work so well. Juuuust kidding! We will explain. But Nike has such a strong brand and such an emblematic logo and tagline that it has become the textbook example we should all strive for. Nike was originally created by a track-and-field coach and a couple of his ex-athletes on the belief that a better designed shoe could improve athletic performance. As you might know, the three men borrowed the name of their company from the ancient Greek goddess of “Victory.” The choice of name, therefore, represents the company’s central values: better products made for winners. What you may not know, however, is that the logo, continues in the same line of thought by representing a simplified version of Nike’s wing (well, she had two) and of her flight to earth to crown the victors. When co-founder Phil Knight first saw the logo Carolyn Davidson designed, he told her: “I don’t love it, but I think it will grow on me.” The reason Knight did not love the swoosh was probably due to its originality: he simply had nothing else to compare it to. But the reason he knew it would grow on him, was because he understood how perfectly it encapsulated the brand. It was Nike’s own wing to fly on. And what about the tagline? No other tagline in the history of branding can lay claim to the amount of inspiration and motivation provided by the three little words of “Just Do It.” What’s important to note is that the tagline doesn’t say what the company does. It’s not “Better shoes for better performance.” Just like the logo can be symbolic rather than spell out a company’s name, so can the tagline represent the brand’s core values, rather than describe a product or service. But why use an apple for a computer company anyway? There’s an internet legend that wants the company’s logo to represent the apple of Knowledge eaten by Adam and Eve, but that’s not true. 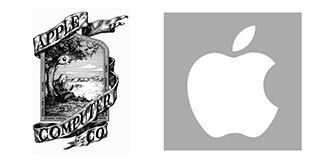 The key to the Apple lies in the logo that Ron Wayne (the third partner to Steve Jobs and Steve Wozniak) created, and that the company used in the first few months of its existence (until the partners found the funds to pay a professional designer to create the now-famous apple). Look at the image on the left. That’s not a logo! That’s a drawing. In fact, the complexity of the image and lines make it a terrible logo, because it can’t be easily reproduced at a small size. But take a close look at what the picture actually shows. There’s Isaac Newton sitting under a tree just before the apple that inspired the law of gravity (according to the legend) fell on his head. The apple of Apple computers, then, is not that of Adam and Eve, but that of Newton! And if you look even closer you will see some writing running around the border of the image which reads: “A mind forever voyaging through strange seas of thought—alone.” That’s not random line—it’s poetry! The lines come from a poem by William Wordsworth, and the “mind” of the poem is that of Newton who is mention by name just two lines earlier. The first Apple logo has all the characteristics of a logo created by a business-owner rather than a designer. And that’s not to bash it. It’s simply to say that the first “logo” really is the snapshot of the brand we were talking about earlier. The founders had a clear concept and vision for their company: The apple that inspired the law of gravity and brought about an innovation in physics would also revolutionize the business of the personal computer. And not only that, but the tagline adds that art (poetry) would accompany the innovation (reflected in Apple’s beautifully designed products). Simple as the official logo may seem, it actually follows in the same principles of simplicity and art in innovation (a mere apple in clean outline) to capture the true essence of the brand. The tagline, moreover, that replaced the line of poetry and that accompanied the logo for many years, “Think different,” enhances the snapshot by means of emphasis. Apple Computers was indeed very different when it came out (as it continues to be today). But the company wasn’t just telling people that it was different and innovative. The tagline encourages all creative minds to keep thinking differently and invites them to join the company in its quest for innovation. And the invitation has indeed been well-received, for Apple has one of the most dedicated and loyal audiences ever. Terry’s Chocolate Orange is a ball of orange-oil infused chocolate, divided into “sections” that look just like orange sections. (Don’t you just love it when chocolate plays fruit?) The genius of this product’s logo and tagline lies in the whimsical nature they add to its personality. If you look at the logo, the word orange looks like orange peel. But the letter “g” also connects the logo to the (actual) giant ball of chocolate by becoming its stem. Although not quite as conceptual as the other two logos we’ve discussed, the style of the letters, the connection of the word to the actual product, and the multiple plays on chocolate and orange within the image and product communicate the idea of playfulness and fun, which is perfect for a chocolate. But then there’s the tagline. And if you haven’t already fallen in love with the idea of a giant ball of chocolate masquerading as orange? Prepare to be swept off your feet! “Smash it pieces, love it to bits.” How clever is that? First, it invites the customer to play with the product and get involved (smash it!). But then it also uses the results of that action (bits and pieces) in an unexpected way (love it to bits) that not only makes us smile, but also totally love it—just as told. An older (but also successful) tagline for the product was: “It’s round but won’t be round for long.” Again the idea of play and double meaning of “round” perfectly encapsulate the cheekily double essence of a chocolate orange, even though in wording this tagline differs greatly from the new one. Now, don’t just sit there pondering the cleverness behind the concepts of these brands. Let’s start creating your very own concept by implementing the “snapshot & caption” technique. 1. If you were to take a snapshot of your brand, what would it look like and why? 2. If you were to add a caption to that snapshot, what would you write and why? And remember… the snapshot and tagline you describe are NOT your actual logo and tagline (so no pressure). They are just the concept behind your brand that will point you towards the right direction. Give it your best shot! Can’t wait to see what you come up with! I wanted to take this opportunity to thank Indigo for opening up her blog to us today! I really hope you find the article useful, and we’re looking forward to reading your comments and/or questions. The tagline is hinting at the business’s mission of helping entrepreneurs use the experience of growing their business as part of their spiritual practice. The “realness” that is emerging in each of us could be thought of as our Buddha nature, which is often represented by the blossoming of a lotus flower–but instead of flowers I like leaves, since so many grow on a single branch. Business is about connection, community, partnership, reaching out to make a difference in other people’s lives, so the abundance of new leaves appeals to me more than the standard image of a single lotus flower. Hmmm…I would say a women in a beautiful, organized closet sipping on a cup of tea looking calm and relaxed. My tag line would be and is, creating a wardrobe you love. Something that connotes that your closet should be a place of peace and creativity, not clutter! I love the image of a woman peacefully sipping tea in an organized closet. Definitely gives the idea of being beyond the chaos. I love this Dionne! “A wardrobe you love” and that is organized seems like such a wonderful solution to the “arrggg I have nothing to wear!” frustration! that we all fee so often! Are you a stylist? Or help women get organized with their style? I wish I was as insightful as this! I do love Chocolate Oranges though – and as many as I’ve eaten, I never noticed the g connecting the orange! I have never had a chocolate orange at all. I do think Julia means the “g” of the logo in the word orange, and how they extended the bottom of it so that it looks like an orange’s stem. Here in the US, when we get oranges they don’t have any stem on them at all. branding is definitely a make or break for a company. you need something different but not to different or it won’t work. I think it depends a lot on the industry you’re in (and the sort of innovations happening within it) and how you want to be perceived, but there’s definitely a thin line between being creative and being obtuse. And the telling of the brand story (not just logo and tagline, but everything from product naming to website copy, images etc) can really make the difference on which side of the line one ends up! this is so awesome and just what I needed to read s I’m trying to increase my blog for a better look. thank you for the help. I have to say, I do think I have branded my blog/self pretty well! EVERYONE talks to me about health and food ALL THE TIME 😉 ha ha ah! I’m glad to have found your blog! This is really helpful. Hmm…what will my logo be? A woman in a beautiful field dancing or jumping for joy or just simply exuding joy and peace? Or a woman on the go, traveling. My ideas are just flooding through. Thank you! This is a great article, it is important to get a good logo and be consistent in branding in order to have a successful enterprise. Yes Janeane! Our logos and taglines give the us a the general direction so it’s important to think them through thoroughly.